WARWICK, RI and CHICAGO, IL--(Marketwired - Jun 19, 2015) - Business travel to Frankfurt and that European family vacation are a little easier and more affordable with Condor Airlines' new, regularly scheduled seasonal service between Rhode Island's T.F. Green Airport (PVD) and Frankfurt, Germany (FRA). Flights will operate on Mondays and Thursdays on a Boeing B767-300. "To our new partner Condor, Dankeschön, and to our new German customers, Willkommen! Today marks a milestone for the airport as this is the first time we are able to offer non-stop scheduled international service to Greater Europe," said Kelly Fredericks, President and CEO of the Rhode Island Airport Corporation that manages and operates T.F. Green Airport. "This service impacts not only the airport, but the state and region with regard to inbound tourism and business development opportunities. We look forward to a busy season of service and are encouraged to see the seats for the 2016 travel season already available for booking." Condor's destination of Frankfurt is a highly populated city in the center of Germany and the financial heart of continental Europe. The region consists of a rich cultural landscape, offering everything from national museums, theatres, operas, pulsating nightlife and much more. Frankfurt is an excellent starting point for tours through Germany and Europe. Support for the entrance of Condor into the Rhode Island market has been a coordinated effort of the airport working in union with government and travel and tourism partners. As part of the marketing efforts to attract inbound tourism from Germany, the Airport and state tourism partners collaborated on a destination marketing campaign in the German market to raise awareness of the new Condor service to Rhode Island. To coincide with the launch, German bloggers will be visiting and reaching out on social media as they tour the Ocean State. Connect at #CondorTravelDingLilRhody and tweet your favorite place to visit. "This is a very exciting day for Condor and the airport here in Providence. We are proud to be the first airline ever to offer nonstop service to Frankfurt from Rhode Island. This new service offers families, business travelers and those on vacation inexpensive options to fly from their local airport to Frankfurt and seamlessly beyond to many other European cities," says Titus Johnson, Vice President for Condor in North America. The new Condor flights offer the best access to New England's tourist highlights such as the beaches of Cape Cod, Martha's Vineyard and Nantucket. The metropolis of Boston is also less than an hour's drive away. One-way tickets are available in Economy Class, Premium Economy Class, and Business Class at www.condor.com or at 1-866-960-7915. Depending on availability fares for Economy Class start at $279. Condor Airlines is the second international carrier to begin scheduled service in as many weeks. TACV / Cabo Verde Airlines began regularly scheduled year round service to Praia, Cabo Verde on June 2nd. Green Airport is also in the midst of an airport expansion program, scheduled to be completed in December of 2017, which enhances the runway safety areas and extends the primary runway to 8,700 ft. for aircraft efficiency. Condor Flugdienst GmbH has been flying its passengers to the world's most beautiful holiday destinations since 1956. On an annual basis, 7 million passengers fly with Condor to around 75 destinations in Europe, Asia, Africa and America. Since 2013, the German airline Condor, is part of the Thomas Cook Group Airlines to which the Thomas Cook Airlines UK, Thomas Cook Airlines Belgium and Thomas Cook Airlines Scandinavia also belong. The fleet of the airlines in the Thomas Cook Group comprises 88 modern and environmentally friendly aircraft, of which 40 aircraft are in the Condor fleet: 12 Airbus A320s, 3 Airbus A321s, 13 Boeing 757-300s and 12 Boeing 767-300s. The aircraft are maintained by the airline's own technical operations. In a representative survey of Focus and Focus Money, called "Mit gutem Gewissen," Condor was elected the most environmentally sustained airline and received the sustainability prize in 2014. Condor is co-initiator of the four-liter-campaign of the federal association of German aviation (BDL): German aviation consumption of kerosene is less than 4 liters per passenger on 100 kilometers. 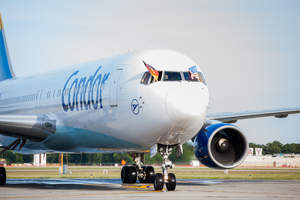 Providence welcomes Condor's first flight from Frankfurt, Germany.